Successfully Added Fingerprint Door Lock - Triple Security Bronson Edition (L) to your Shopping Cart. The new ultimate solution in business and home entry, the J29 Fingerprint Door Lock. An all-metal door lock for use when only the highest quality in door entry security is acceptable. If you need presidential level protection and won't settle for anything else, look to the J29 Biometric Fingerprint Door Lock - Triple Security Bronson Edition. Top Level Security: The Bronson Edition Triple Security Fingerprint Door Lock uses the same technology that guards todays most important locations such as bank money rooms, CEO offices, government laboratories, and royal palaces. That means it is the most trusted system for protecting some of the most sensitive and secure locations known to man, so if you use this as the primary door lock of your business or home, then you are assuring yourself that only authorized persons can access any rooms or buildings utilizing the J29 Biometric Fingerprint Door Lock. Perfect Entry Management: Losing or misplacing your keys is extremely easy and poses a huge security risk. Not to mention, standard door handle/lock systems can be easily picked. With the Bronson Edition Triple Security Fingerprint Door Lock, access is granted by a state-of-the-art 3D optical sensor that can't be broken into or tricked into allowing in intruders and opens in just seconds for those who have clearance. For those who need it, PIN Code or Key Entry options are also available to provide you with three entry options (triple security). Indestructible: The thoughtful design using an all-metal structure with only the best brass components is more than just a symbol of the trust you can place in this device. The J29 Fingerprint Door Lock gives you the full Bronson guarantee, meaning it is Fireproof, Weatherproof, and comes in a compete kit giving you everything you need to install it and start using it right away. In fact, your building will fall apart before the Bronson Edition Triple Security Fingerprint Door Lock even gets a scratch! Factory-Direct: Our keen observers may realize this looks just like the Axxis BDX-29 or BioBolt HOL-28 you saw advertised for $1000 in famous Office and Home Design magazines. Well, the J29 Triple Security Bronson Edition Fingerprint Door Lock is made at the same factory that does the production for many of the top brands in the biometric door lock industry. What does that mean to you? That you will get the exact same quality product, but at less than half the price! For total security, convenience and dependability for a lifetime, the J29 Triple Security Bronson Edition Fingerprint Door Lock is a small price to pay. This (L) version is meant to be used with left-hinged doors. Built from only the highest grade materials and made for only the highest level of safety, this is the ultimate in security for the 21st century. Available at a low factory-direct wholesale price, this unit is actually cheaper than many "premium handle w/keys for front door" units you can find at door specialty shops, yet is twice as good! Don't wait for a break-in to happen, prevent it now with the J29 Triple Security Bronson Edition Fingerprint Door Lock from chinavasion.com. Features an On/Off button on the back. "Off" means it does not lock, so you can turn it off when you step outside for a moment and don't want to worry about swiping your finger or using your key. The Bronson Triple Security Fingerprint Door Lock - only available here! If I cut my finger, will the unit still work? Yes, just open the door by password or key. You may also want to register 1 finger on each hand to avoid any future issues like this. No, only the person who knows the 8 digit master code (or is the administrator fingerprint - the 00 fingerprint) is authorized to enroll new users. Under normal use (15-20 accesses per day) the fingerprint lock should operate for a year on a single set of name brand alkaline batteries. No, the system configuration and user information/data are saved in a non-volatile flash memory data and may be stored indefinitely without the need of batteries. If my finger gets dirty will it still work? The fingerprint sensor uses RF techniques to collect data from below the skin, therefore the reading ability is not affected by dirty. It is advisable, however, to wipe dirt and sand off prior to swiping to avoid scratching the sensor's protective surface. The battery is dead and I left the key is at home, what do I do?! There is a 9V battery connector located below the door knob at the bottom frame of the unit; a simple connection using a 9V battery will bring it back to life. 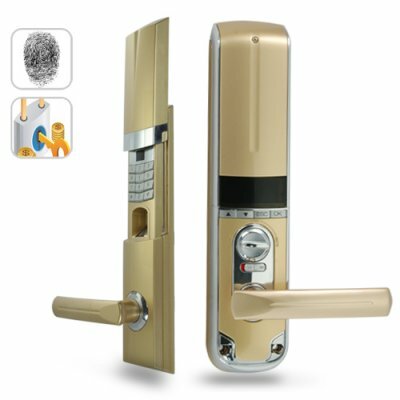 Is the Bronze Fingerprint Door Lock, CVPW-J29, waterproof? No, but it is weatherproof, meaning any moisture build up from fog or frost will be fine, but it should not be placed where it will be under un-sheltered areas with constant water exposure. I heard this security gadget has a tamper alarm and latch bolt alarm, what is that? Tamper Alarm: If the exterior set outside is damaged by outside force, the buzzer will give off a continuous beep for alarming. Great for knowing when someone has tried breaking in and scaring thieves off. Latch Bolt Alarm: If the door is not properly closed and the latch bolt is pressed into the lock set, the alarm will sound. Useful as a reminder that the door has not been closed properly. I saw the red light but I still forgot to change the battery and the key is at home, what do I do?! I followed the instructions exactly but my fingerprints aren't being read, what's going on? This unit uses a swipe sensor, which is different from a press sensor. You need to slowly swipe your finger down the fingerprint reader. Where is the key hole? On the door handle. Lift the plunger on the rear side of the exterior handle up and slide the cover to the right.